Interested being a Medical Aesthetic Practitioner Certified? Credentialing Exam for Medical Esthetics! 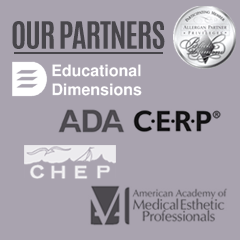 Interested in getting Credentialed as a Medical Esthetic Practitioner Certified? Upon passing the exam, you will be one of the thousands of certified aesthetic healthcare professionals by the American Academy of Medical Esthetic Practitioners (AAMEP). These licensed medical professionals who practice in their specific fields can already prove the importance of their certification in relation to their careers. Your certification designates that you have met the standards set by your peers in your specific area of practice. Medical Esthetics continues to be an emerging specialty in the United States and has been a widely used specialty in Europe for more than 25 years. We can personally reassure you that the pleasure that you will gain in becoming certified will stick with you throughout your career. If you would like more information please see the credentialing portion of the AAMEP website.